The San Francisco 49ers have had a busy off season. After finishing 2-14 (with their only 2 wins coming against the LA Rams), the 49ers fired head coach Chip Kelly after only one season. They also fired General Manager Trent Baalke. A tumultuous season indeed, especially after watching then-backup QB Colin Kaepernick sit during the national anthem, motivated by alleged oppression against black people and other non-white races. 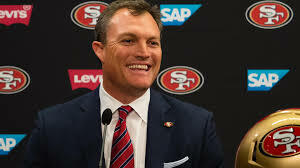 Because of their terrible record, the 49ers secured themselves the #2 pick in the draft. It remains to be seen if they will select a QB or not (i.e. Mitch Trubisky*, QB, North Carolina; or Deshaun Watson*, QB, Clemson). The 49ers also poached the offensive coordinator, Kyle Shanahan, from the Atlanta Falcons and made him the 4th new head coach for the Niners in the last 4 years! At the same time, they also hired new General Manager, John Lynch. This entry was posted in Uncategorized on March 16, 2017 by BronsonQuon.